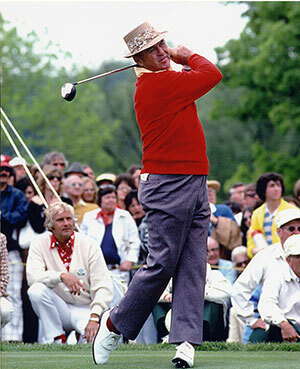 Sam Snead has won more golf tournaments than anyone. At a young age, he caddied at a golf club near his home, and with the support of some club members he went to California in 1937 to compete on the professional golf circuit. He earned five second-place finishes in tournaments that first year, including a two-stroke loss to Ralph Guldahl at the United States Open. Snead soon became one of the leading professional golfers. He won the PGA championship in 1942-49-51, the Masters tournament in 1949-52-54, and the British Open championship in 1946. Snead also was a member of eight U.S. Ryder Cup teams (1937, 1947, 1949, 1951, 1953, 1955, 1959, and 1969 as a nonplaying captain.) He won the United States Golfers’ Association (USPGA) Seniors Championship six times (1964, 1965, 1967, 1970, 1972, and 1973) and in 1965, he also won the Greater Greensboro Open competition in North Carolina, making him the oldest golfer on the men’s circuit to win a regular PGA tour event. Also known as “Slammin Sammy”, Snead was recognized for his sidewinder putting technique, in which he faced the hole and struck the ball with his hand low on the club shaft. He wrote Natural Golf (1954) and The Education of a Golfer (1962). Snead won his only first Virginia State Open in 1946 at Virginia Beach on the Cavalier Yacht and Golf Club. It was a shootout between Sam and longtime rival Chandler Harper. It had to be one of the most unusual tournaments finished in the history of golf. Trailing the leader, Snead, by nine strokes, Harper shot a sizzling 63 on the last day to tie Snead, who carded 72. In the playoff the following week, Snead led Harper by five strokes through the eighth hole, but Harper rallied and led by one through the 14th. Snead birdied the 15th, 16th, 17th, and 18th holes for a 64, and Harper had 67.